Begin the day with a trip to the top of Mount Scopus, one of the few places from which both the Dead Sea and the Dome of the Rock can be seen. Marvel at your first panoramic view of Jerusalem from the Haas Promenade. 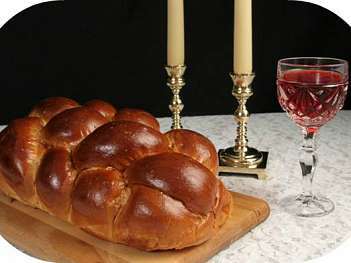 Together with the members of the tour, collectively we recite the "Shehechayanu" blessing and toast l'chaim to celebrate your visit to Israel. Enter via the Zion Gate which leads to the Armenian Quarter and walk through the restored Jewish Quarter passing the excavated Roman Cardo. At the revered Western Wall, a specially arranged walk takes us through a newly opened 1200 foot long tunnel excavated at the time of King Herod used as an aqueduct to channel water to the Temple. 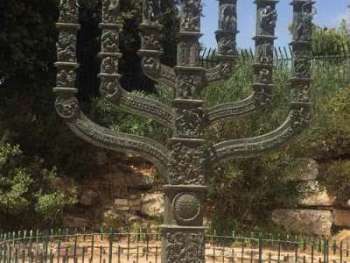 On our way to Israel Museum we will pass by the Knesset, Israel's Parliament, there stands the 5m – seven-branched bronze Menorah, the symbol of the Jewish people. Across the way is the modern Supreme Court Building, the highest judicial court in Israel. Proudly sitting on a hill in Givat Ram, the Israel Museum was founded in 1965.The white domed Shrine of the Book represents the lids of the jars in which the famous Dead Sea Scrolls were found near Qumran. Across the way is the Billy Rose Sculpture Garden, a unique blend of Zen and Western art principles. Marvel at the meticulously recreated 1:50 Scale Model of Ancient Jerusalem during the Second Temple period which was transferred to the Israel Museum in 2006 at a cost of $3.5 million dollars. Later at the hotel join the Rabbi for your Bar/Bat Mitzvah rehearsal. Free evening dinner is on your own. Now it’s time to roll up your sleeves to take part in a 3-hour program of digging, sifting and touring Beit Guvrin National Park. Who knows what we might find on our archeological dig at Tel Maresha, a UNESCO World Heritage Site. Continue to Rehovot to visit the Ayalon Institute, a secret underground ammunition factory where you will learn of the bravery and ingenuity of pre-state freedom Hebrew fighters. Pay a visit to the Yad La-Shiryon Museum in Latrun (between Jerusalem and Tel-Aviv/Jaffa) Famous around the world for its unique and diverse collection of tanks and armored vehicles, this is a `hands on` visit for the children as they can actually climb up on the combat tanks. This was the staging area for the Independence War. At the Armor Corps Museum learn about the battles that secured the road to Jerusalem which led to victory. 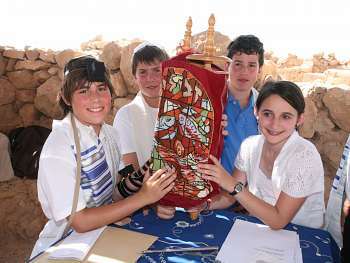 This is YOUR SPECIAL BAR/BAT MITZVAH DAY. 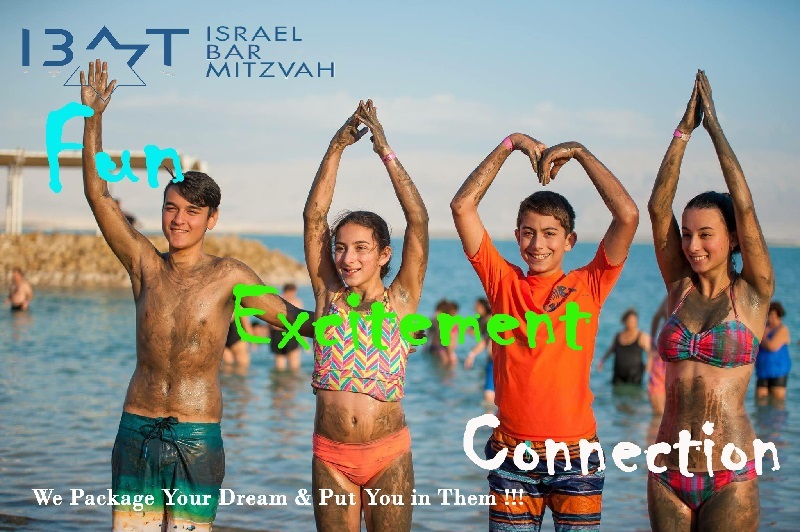 Drive through the Judean Wilderness to the Dead Sea, the lowest point on earth, some 1200 feet below sea level and continue on to the UNESCO World Heritage Site of Masada. An exciting 3 minute cable car ride will whisk you to the top to view the excavations of the Herodian palace, storerooms, bathhouse and water Reservoirs. Visit the ruins of the small Synagogue which served the Jews of Masada and the Beit Midrash (Torah Study Hall). Your guide will retell the harrowing tale of the 967 zealots (men, women and children) who chose to commit mass suicide rather than be enslaved by the Romans. Here we will meet our Rabbi to witness the joy of your child coming of age. Our day begins with a somber visit to Yad Vashem, Israel’s memorial to the Holocaust where tour members take part in a Yizkor service. See the poignant Children’s Pavilion, the new Holocaust Museum and the Valley of Destroyed Communities where the names of 5000 lost communities have been inscribed in the stone walls. After such a difficult visit to Yad Vashem we need our tranquil time and to change our mood by visiting to the Ben Yehuda Street in Jerusalem where it is happening, lots of locals are celebrating the coming of the weekend by spending time on this beautiful exciding and happening street of Jerusalem, Cafes, shops around to explore. 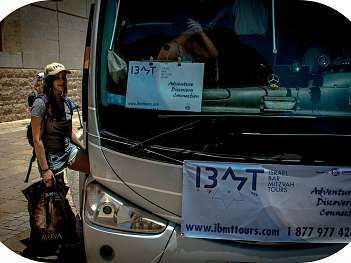 Leaving Jerusalem behind we head for the Galilee and Kfar Kedem situated between Tiberius and Haifa, next to Tzippori where a hands-on experience will transport us back in time to life as it was in a Jewish village in the Galilee some 2000 years ago. Wearing authentic clothing, you will ride donkeys, turn wheat into bread and feast on a rustic Galilean meal. This is an experience not to be missed. Before we depart for Safed we will have a light lunch at the village. Safed, one of the four holy cities is also the home of Kaballah (Jewish mysticism). This charming town filled with cobblestoned streets and lined with ancient synagogues and artists' galleries, offers breathtaking views of the entire Upper Galilee. 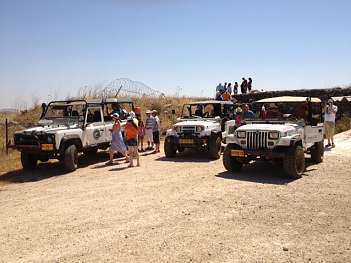 Explore the geo-politically vital Golan Heights by a private jeep this morning. Travelling off-the-beaten-track roads, we will hear about the decisive battles fought in this area. In Biblical times referred to as Bashan, the captivating beauty of the Golan becomes more beautiful as you go higher. Stopping at an observation point overlooking Kuneita and Syria, you will gain a meaningful perspective as to the significance of the strategic Golan Heights. 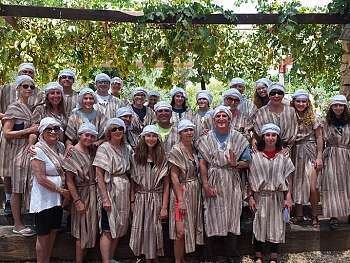 Now for some fun as we head to Ein Zivan to participate in chocolate making at the famous De’ Karina chocolate factory. Established by Karina Chaplinski, De Karina Chocolates has gained an impressive reputation as a gourmet chocolatier. Hear about the history and culture and take part in a hands-on workshop. (For the adults we will visit a winery and take part in wine tasting). 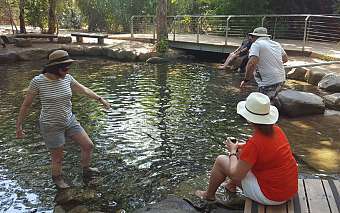 We set our sights on the Tel Dan National Park combining a lush nature reserve with a Biblical archaeological experience with three easy hiking routes and a short wheelchair-accessible trail. At the heart of the park is Tel Dan, the capital of the ancient northern kingdom. 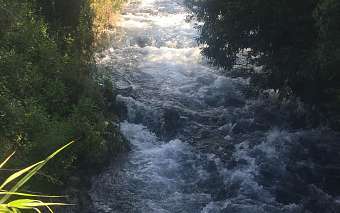 The Dan River, one of the sources of the Jordan, flows through the reserve, its water coming from the snowmelt of nearby Mount Hermon. A wading pool offers a refreshing break. Around noon time we will start our day by visiting the famous in door Sarona Market and you will have time for taste a large variety of food & cuisine only created in Israel. Enjoy lunch on your own from a large variety of different cuisine the market will offer you. This afternoon moving on to ancient Jaffa where Jonah began his adventure with the whale. A perfect place for people watching and good food. Take a short walk through the restored town before returning to Tel Aviv with its narrow byways filled with artist galleries and cosmopolitan shops. A city full of secrets, surprises and adventures. We finalize our tour today with the Independence Hall, originally the Dizengoff House, where the Declaration of Independence was signed by the first Israeli Prime Minister David Ben Gurion in May of 1948. Tonight, enjoy a special farewell dinner at Goshen restaurant a five stars cuisine. Overnight in Tel Aviv. A full day at leisure to enjoy the amenities of the hotel and beach. 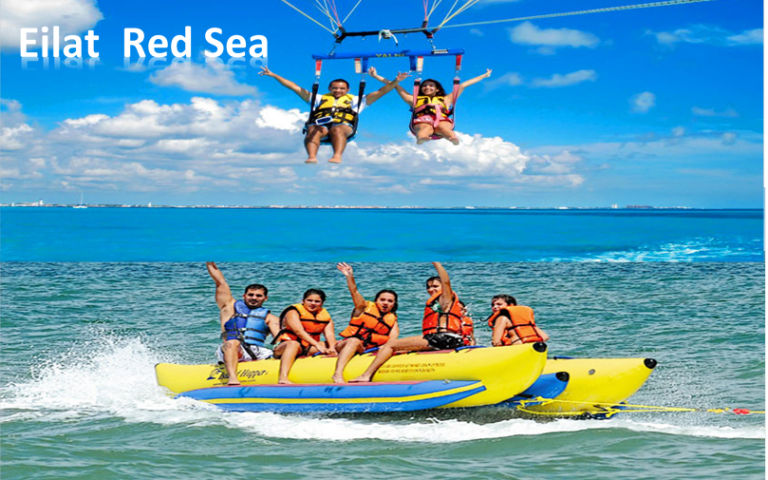 Perhaps an optional Banana boat ride, Para sailing or other water sports at the beach. 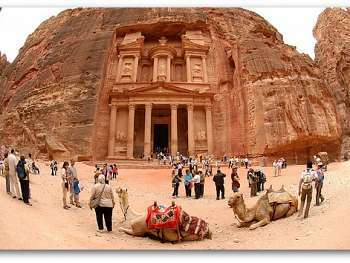 For those wanting to explore an optional side trip to the rose colored ancient city of Petra (Jordan) is available. (Participants will need a valid passport to enter Jordan). Petra, one of the Seven Wonders of the World rediscovered in 1912 by a Swiss explorer named Johannes Burckhardt. This rock cut capital city of the industrious Nabataeans holds many secrets and is one of the world’s richest archaeological sites. As you exit the winding Siq, nothing can prepare you for what you will see. The Treasury is the first of many wonders that make up Petra. 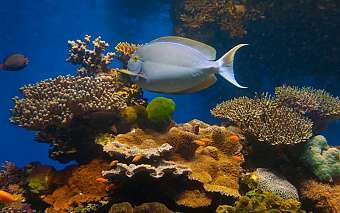 At the end of the tour return to Aqaba crossing the border back into Israel and to your hotel in Eilat. Overnight in Eilat. The Treasury, the greatest monument of Petra comes into view. At the end of the tour return back to the border and continue on to your hotel. 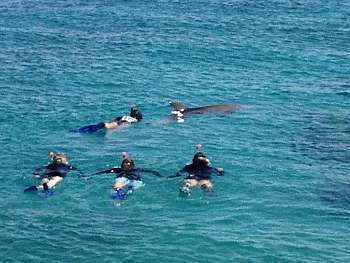 This morning see Eilat’s rich underwater marine life without getting wet beginning with a visit to the Underwater Observatory (over 800 species, the only one of its kind in the world) and the Shark Tank, the largest shark pool of its kind in the Middle East. An unforgettable experience as you learn about these deep sea predators. On board your transatlantic flight there is time to reflect on your visit and to start planning your next trip to Israel! Arrival in North America the same day. SHALOM!